I’ve been having lots of fun with cake/cupcake towers lately. I shared a couple of them over on Facebook and I have a few more to share over the next few weeks! This was done for a vow renewal ceremony to renew wedding vows. 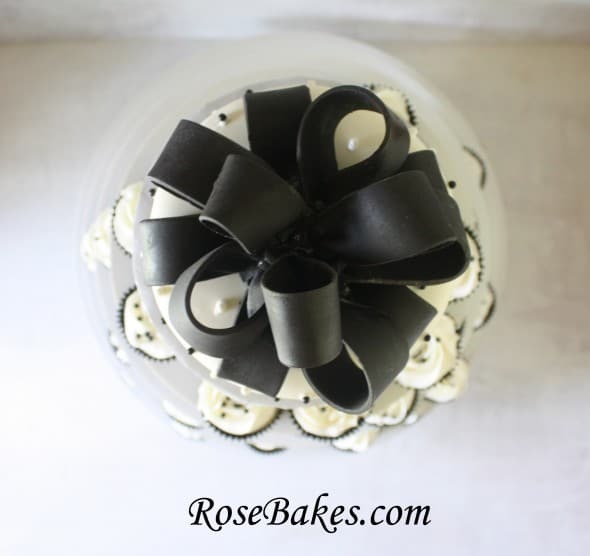 Their colors were black and white, so I did cupcakes in black glassine cupcake liners with white buttercream roses and black sugar pearls. 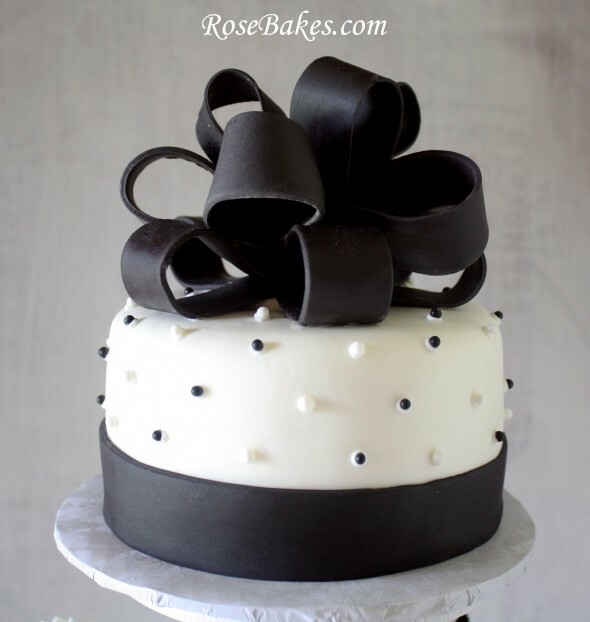 I did a 6″ round cake on top with a black poofy bow (see how to make one of these here). I used black and white sugar pearls on the cake. The cake was vanilla cake and the cupcakes were white wedding cake. All of them had vanilla buttercream. 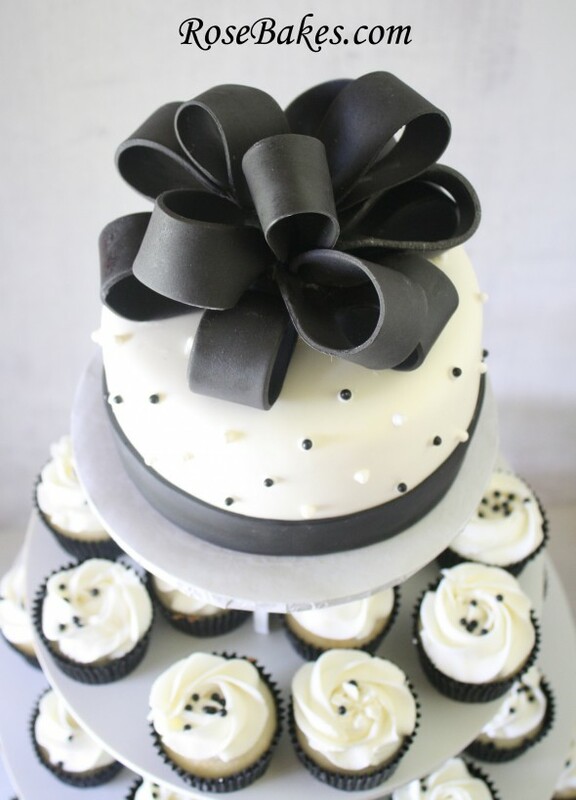 The cake was covered in marshmallow fondant with Satin Ice Black Vanilla fondant for the bow and ribbon border (see how to do the bow here, and how to do a ribbon border here). The cake and cupcakes are displayed on a Smart Baker stand (which I absolutely love, by the way). Hi Rose! This setup looks really pretty, yet so simple and sophisticated! That stand is awesome as well, I would love to have one like that. So, off the topic, I was wondering if you had a tutorial on how to do checkerboard fondant, like the one for the car’s cake you did last year? Thanks for all your help & tips! 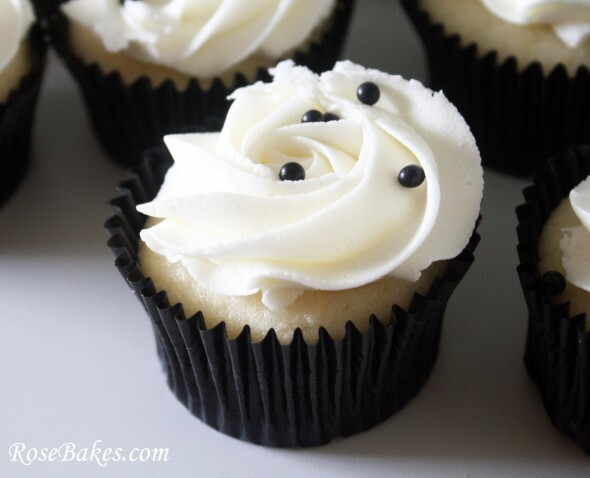 Hello again, I was looking for square cupcake towers and I remember seeing one here, then I look for one on amazon and some of the feed back was not good. 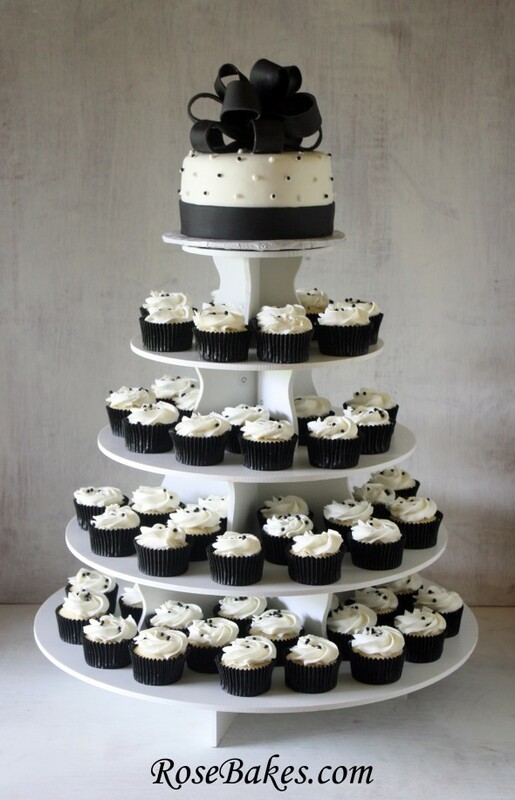 I really have only made one cupcake tower for a friends daughter, but now my sister-in-law is getting marry in april and wants a set up like this. How was your experience with yours? Can you use it over and over? Also when you have an order for cupcake towers, do you rent them or is that included in the price? I know this last question is a little more private and I understand if you can’t answer. Thanks anyway. BTW I’m a huge fan of your blog! I don’t know how you make it work with your kids, I only have 2 and sometimes wait until they go to bed so I can decorate. Have a great week end! Hi Diana! I really like my towers. I did have some issues with them fitting together the first couple of times I used them, but my hubby helped me sand down a couple of edges that weren’t fitting well and now they work perfectly!! Yes, you can use them over and over again – they’re made from PVC and they wipe down very easily! You could probably even put them in the dishwasher if they’d fit. I rent mine out and require a deposit above the rental fee to guarantee that I get it back. When the stand is returned, I refund the deposit, but not the rental fee. My name is Knight and I want to make the best cake for my sisters birthday and I was hoping you could send me a recipe similar to the one above, except the cupcakes. 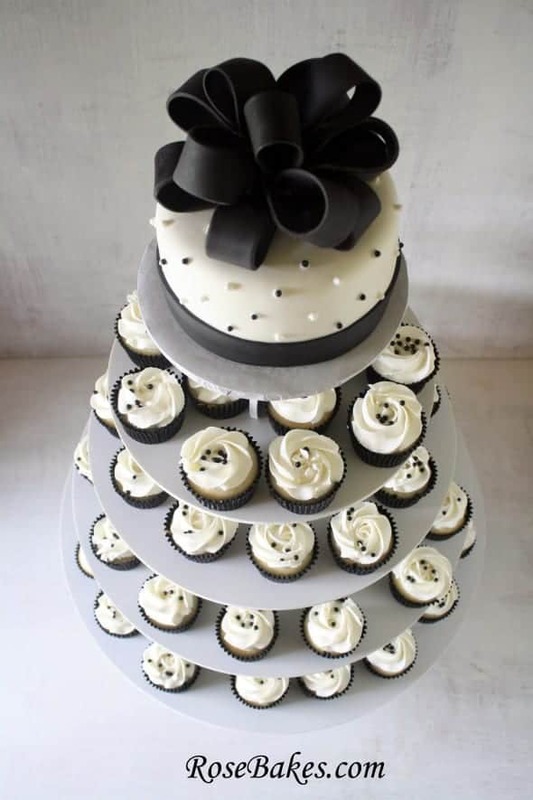 Me and my sister were looking for ideas on Google Images and I was hoping that you could send me something similar to the main cake at the top. I hope you can help me. I have links to all of my recipes in the post! 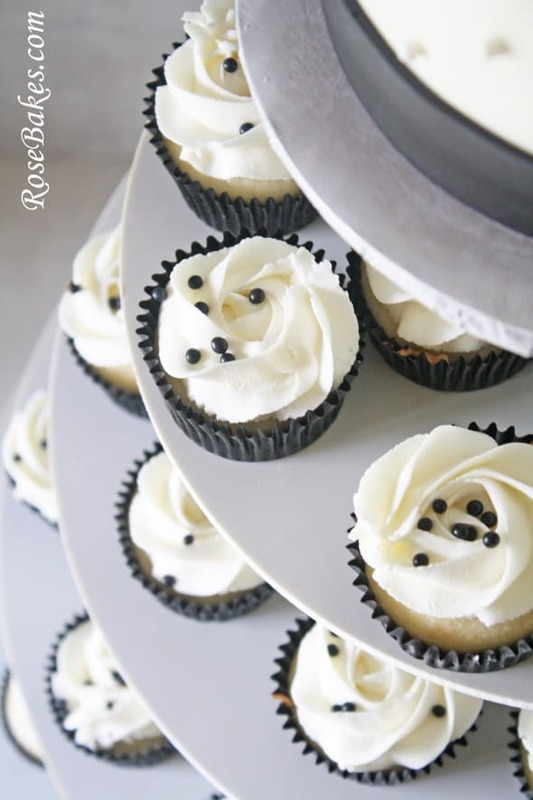 Rose – Was the cupcake stand difficult to put together? I am debating purchasing it and want the reviews are mixed as to ease of assembly. Thanks! It was at first, but I got my husband to use a file on a couple of spots that were sticking and it works well now. It’s around $75 and you can get it here on Amazon: Smart Baker Cupcake Stand. Hi there, I love this idea for a wedding or party. 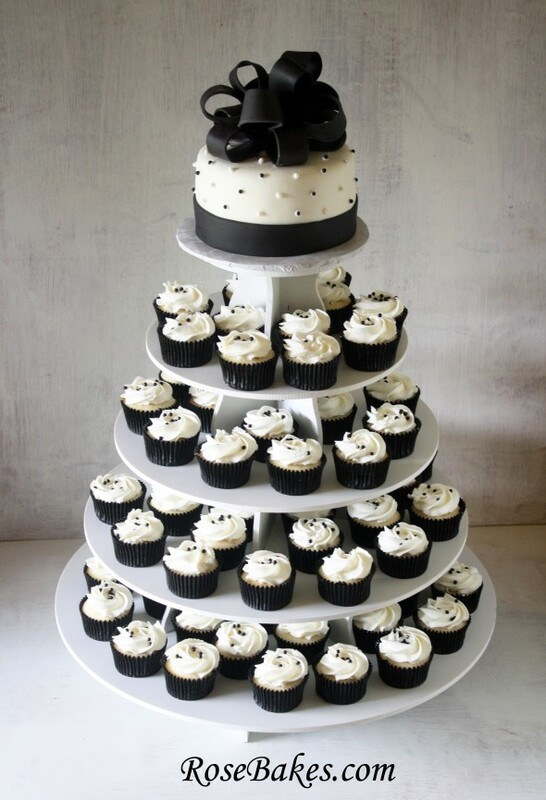 I was wondering about how much something like this would cost with the cake and cupcakes? I charge $36-50 for the cake and $15-20 per dozen for the cupcakes. what tip did u use on the cupcakes.